Social democratic regime types do not protect capitalist economic freedoms as basic constitutional rights. As a result, they empower legislative bodies to create and administer monopolies (or heavily regulated quasi-monopolies) in pursuit of socially desirable goods. The constitutional design of market democratic regime types, by contrast, encourages market-based forms of social construction. The market democratic emphasis on capitalistic economic liberties effectively limits the reach of legislative and administrative bureaucracies with respect to distributive issues. Abstract: 25% of teachers were absent from school, and only about half were teaching, during unannounced visits to a nationally representative sample of government primary schools in India. Absence rates varied from 15% in Maharashtra to 42% in Jharkhand, with higher rates concentrated in the poorer states. We do not find that higher pay is associated with lower absence. Between 2006-07 to 2012-13, nationally the teacher attendance though improved to 84.3% from 81.7% at the primary level and 81.3% from 80.5% at the upper. The legislation, presently prepared in the form of an Ordinance by the Higher Education Department, has been cleared by the Planning and Finance Departments and it has now been forwarded to the Law Department for vetting, sources said. Abhishek Gupta seeking the stay of section 16 of the act argued that RTE makes the learning and teaching process doubtful. The principal of SMK Balung, Matnoor Sima, said students who attended the class are those who were weak in terms of learning, hyperactive and children who have a short attention span. Does functional English (written/spoken) make a difference when children from poor families appear for education/job interviews? 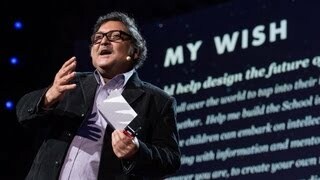 On stage at TED2013, Sugata Mitra makes his bold TED Prize wish: Help me design the School in the Cloud, a learning lab in India, where children can explore and learn from each other -- using resources and mentoring from the cloud. Hear his inspiring vision for Self Organized Learning Environments (SOLE), and learn more at tedprize.org. Watch this video here.